How to organize blog posts ~ Elan Creative Co. If you are new to blogging, chances are you are not thinking about organizing your blog posts. But when you have hundreds of posts, it’s hard for you and your readers to navigate the blog and find the right post. 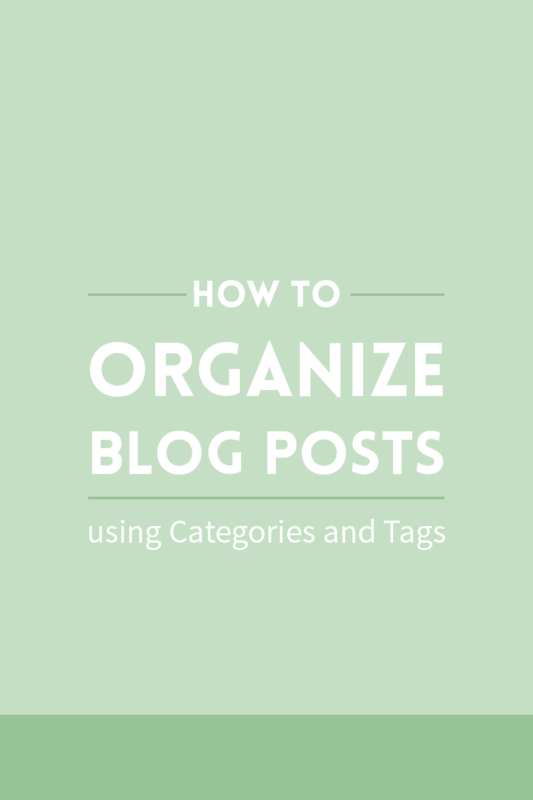 One of the easiest ways to organize blog posts is by using categories and tags. A lot of bloggers underutilize categories and instead try to use pages for this purpose so I want to show you how to use them. 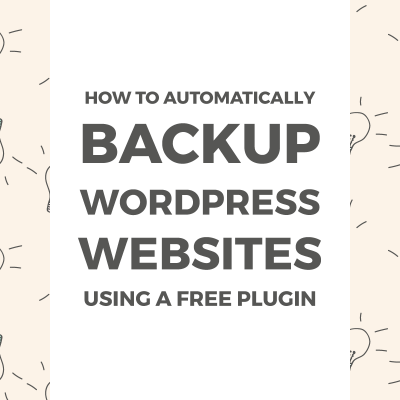 WordPress and Squarespace have categories and tags, while Blogger only has labels, but no matter what platform you use, you can still follow these instructions to organize your content. Categories and tags often confuse people because they seem to be alike, so let’s look at the differences. Categories are meant for a broad grouping of your content. 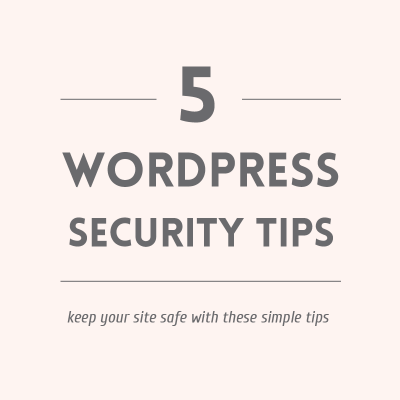 These are usually general terms that help people identify what your blog is about. Tags, on the other hand, are used to describe a post in detail. If you have a food blog, your categories could be Sweet and Savory. When you write a chocolate chip cookies recipe, you will add it to the Sweet category, but you can also tag it with chocolate and cookies, so it will show up when someone searches for chocolate or clicks on the chocolate tag. Posts should always be under a category, and if you don’t use one they will be added to the default Uncategorized, but tags are optional. When you create categories and tags, you shouldn’t use the same word for both of them. So if you have the Sweet category, you shouldn’t add Sweet as a tag. This practice won’t help Google find your blog easier. The same goes for single and plural. If you have Sweet, there’s no need to add Sweets. There are two very simple ways to add categories to your blog posts. You can easily create new categories or add your posts to existing ones when you write a new post. You can find the Tags and Categories menus on the right side of your text editor. If you can’t see them, you can turn them on from Screen Options, at the top of your post editor. Just click on Add New Category to create a category or select one of the categories you already have. If you have been blogging for a while, but don’t have categories or you want to organize your categories, you can do that from Posts > Categories. Or Posts>Tags to edit your tags. One the right side, you can view your existing categories, while on the left you can view the Add New Category menu. When you add new categories, you can add the name, slug, parent category and description. I like to use parent categories because they make it even easier to browse the site. For example, I have a parent category that’s named Tutorials and it includes Photoshop Tutorials and Illustrator Tutorials. If we go back to our food blog analogy, we can create a parent category called Recipes and add Savory and Sweet to it. Or we can make Savory the parent category and create new categories for Breakfast, Lunch, and Dinner. If your posts are all under the Uncategorized label and you want to create new categories, you can create the categories from Posts>Categories and use the quick edit option instead of editing all your posts. Go to Posts>All posts, move your cursor over the name of the post you want to edit and choose Quick Edit. This will bring up a small menu that lets you edit the name of your post, slug, category, tags, and you can even make it public or private or disable comments. Just select the category from the Category menu and add the tags you want to use. Don’t forget to update the post. A lot of bloggers add pages to their navigation menu instead of categories. Even though both pages and categories can be added to the navigation menu, they are not the same. Pages are static. That means you can add images and text, but you will have to update them manually. Categories are dynamic. Every time you write a new post and assign it to a category, that category will automatically show your post. So if you want to add the Sweet and Savory categories to your navigation bar, you don’t have to create new pages for them. To add categories to your navigation, just go to Appearance>Menus and search for the Categories menu on the left side of the page. Click on it to view the categories. Select the categories you want to add to your navigation bar, update the menu and save. Your tags and categories are like a map of your site that will help your readers find important information. For an easier navigation, you should develop a short list of categories and if you want a more specific label, add a smaller category under a parent category or just use tags. My main categories are Freelancing, Tutorials and Design&Coding. 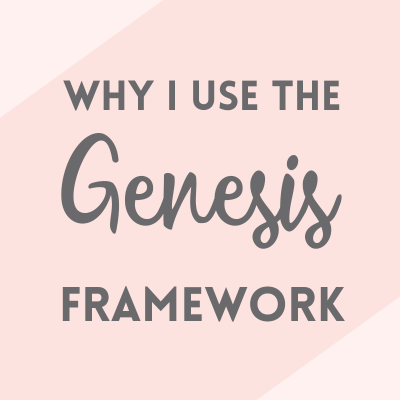 They not only help me organize my content, they also help create new posts and help maintain consistency. Since I’ve been blogging for a while, I also have categories that I don’t use that often or they are for things I don’t blog about anymore. Help define your niche: Spending a couple of hours streamlining your categories, will also help you narrow down your niche. I also love writing about different subjects, but your blog will be more professional and consistent if you choose a couple of subjects and write mostly about them. Create new content: It’s so much easier to create new posts when you already have the broad strokes. You can also refer to your categories when you don’t know what to write about or when you create an editorial calendar. 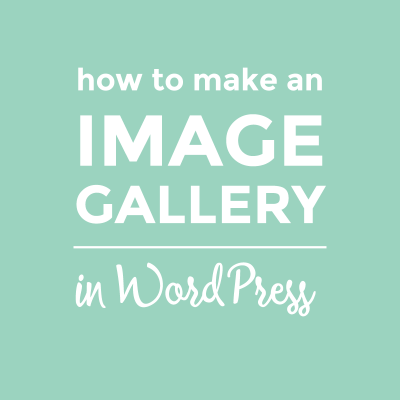 Easier navigation: I love to browse other people’s blogs and hate it when the posts are not categorized. 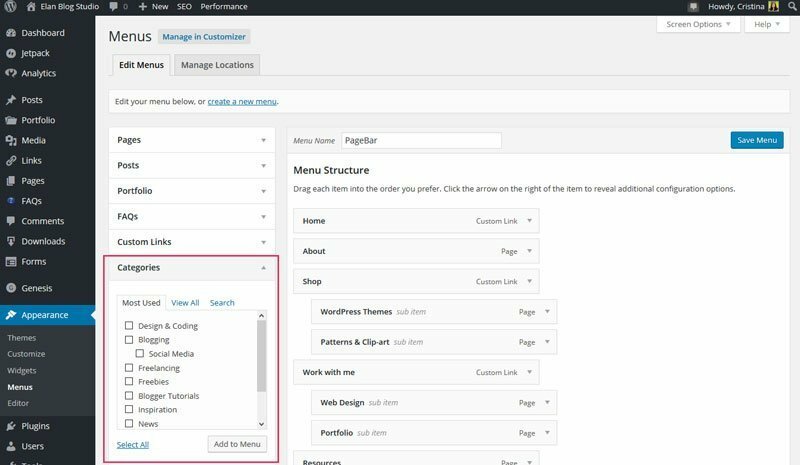 Having your categories listed in the navigation menu, sidebar or even under the posts will help your readers find more posts and stay on your site for longer. SEO: An organized site can boost your SEO. One of the ways it does that is by encouraging your readers to spend more time on your blog, thus lowering your bounce rate. But categories and tags archives are also landing pages and can rank high in search engines. How do you organize your blog posts? Are you using categories or is this something you thought about, but haven’t tried? Cristina, I just found your site and subscribed right away after reading only a couple of your blog posts! This one on organizing your blog posts is just what I was looking for and didn’t even realize it! I’ve been blogging for many, many years but my post organization was nonexistent, so this was perfect timing. Hey Cathryn, I’m so happy you like my blog! Organizing is so important and it’s easy to overlook it. My blog was a mess when I move it from Blogger and it took quite some time to categorize everything. GREAT POST!!!!!!!! My blog has only been up about 6 months and I was painstakingly adding each post to a series of pages on my main menu. Then I started to struggle with the dropdowns going too far down. Not sure why categories instead had eluded me but your post was gold!